This is the best yin yang yoga routine for mornings. In just an hour you will be able to wake up and take on your day better than a cup of coffee. Instead of starting our day scattering and draining our energy by sending it outwards, scrolling through social media, we are going to gather our energy so we have the vitality, strength and endurance for your day. In yoga we call energy prana or your vital life force energy. It is there to be cultivated and when it flows through your body smoothly and evenly, you will glisten and sparkle from the inside out. In this yin yang yoga class for mornings we will balance and harmonize your energy or prana so that you can function at your best today. We will begin with a 30 min yin yoga sequence for flexibility and to focus on the meridian channels while your muscles are cool and stiff from sleeping all night. Starting with the gallbladder meridian, yin yoga poses to support the gallbladder meridian will help you plan your day and make decisions. Through yin yoga postures for the gallbladder meridian you will feel inspired, passionate and ready to take action. From there we will shift our focus to the most important reservoir of essential energy in your body, the kidneys. By nourishing kidney energy you will build courage and willpower. The yin yoga poses for your kidneys and kidney meridian will provide the strength and endurance to work hard through your whole day. 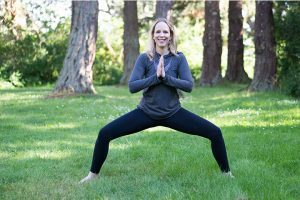 Following the yin yoga portion of the class we will move on to the yang portion of the class which will be even more energizing and faster paced. We will begin with cat pose to wake up your central nervous system and improve the communication between your body and your mind. Your spinal nerves carry signals to your mind, this simple pose will improve your focus and concentration for the day. Focusing on your core with boat pose will build your self-confidence and self-assurance for the day. Support and stability for your day will be created through standing postures as we continue to gather the prana and energy into your body. Balancing postures create further focus and concentration for your day. Backbends will help you open to new possibilities in your day.